Hermes St Farandole 18k Rose Gold Horsebit Toggle Bracelet 7"
For your consideration is a Hermès 18k Rose Gold Horsebit Toggle Bracelet from their signature St. Farandole collection in pre-owned condition. This bracelet shows light signs of wear and features three various sized oval links connected by a thin chain with a toggle closure crafted in fine French made 18k rose gold. Largest oval link measures 17mm by 10mm by 2.5mm. Will fit up to a 7 inch wrist. Weighs 13 grams. Please view our photos for additional information. 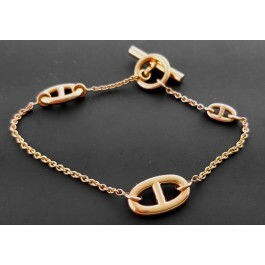 You're reviewing: Hermes St Farandole 18k Rose Gold Horsebit Toggle Bracelet 7"